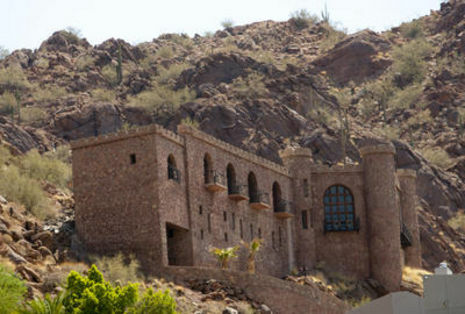 A Camelback Mountain castle that has been a financial nightmare for its owners has sold for $1.45 million. Robert Pazderka bought the 7,900-square-foot Copenhaver Castle on the southwestern flank of the mountain and expects to spend $3million to $5 million renovating the unusual stone fortress with its secret passages, dungeon and a spa the size of a moat in the living room. "I've lived on Camelback for 15 years, and this is a landmark property," he said. "Unfortunately, it's been neglected. I hope to bring it back to the magnificent property that it is." The faux Moorish castle is an oddity among the expensive hilltop homes on Camelback Mountain. It was built by Dr. Mort Copenhaver, an orthodontist, over the course of a decade starting in 1967. The castle sits 1,200 feet above Camelback Road and includes turrets, a drawbridge fire escape and a fireplace that at one time included a 17-foot waterfall. Pazderka is the president of the Armored Group LLC, which makes armored trucks and cars in Detroit. He said he expects to get some public-relations value out of the castle and its link to the company name. The sale closed May 25, said agent Jan Atwater of Home-Smart Real Estate, who had the listing since January. Copenhaver Castle has long been viewed as a landmark. Atwater said she was flooded with calls from people with stories about their connection to it or who wanted a weekend stay or to get married there. The property has been a financial albatross for its three previous owners. Copenhaver put his castle up for sale in 1985 for $7 million, a princely sum at the time, but two years later cut the price to $2.5 million. No buyer emerged, and Copenhaver lost the 1.1-acre property in a bankruptcy when his dental franchise business collapsed. Jerry Mitchell, who helped develop the Rawhide theme park in Scottsdale, bought the bank-owned castle in 1989 for $985,000 through his Camelback Castle Corp. That entity filed for bankruptcy in 2004. The Old Standard Life Insurance Co. picked up Copenhaver Castle for $2.6 million in 2005. It was foreclosed on again and sold as an asset of the stockholders when the insurance company was liquidated, Atwater said. Pazderka said he would like to get the property designated as a historical landmark and plans to live in it after an extensive renovation. "It's going to take a lot of money and a lot of time," he said.